Maija Miettinen: Rhythm of the Whole will be on display at the Finlandia University Gallery, located in the Finnish American Heritage Center, Hancock, from June 2 to August 3, 2016. An opening reception at the gallery will take place on Thursday, June 2, from 7 to 8:30 p.m. with an artist talk beginning at 7:15. The reception is free and open to the public. Refreshments will be served. 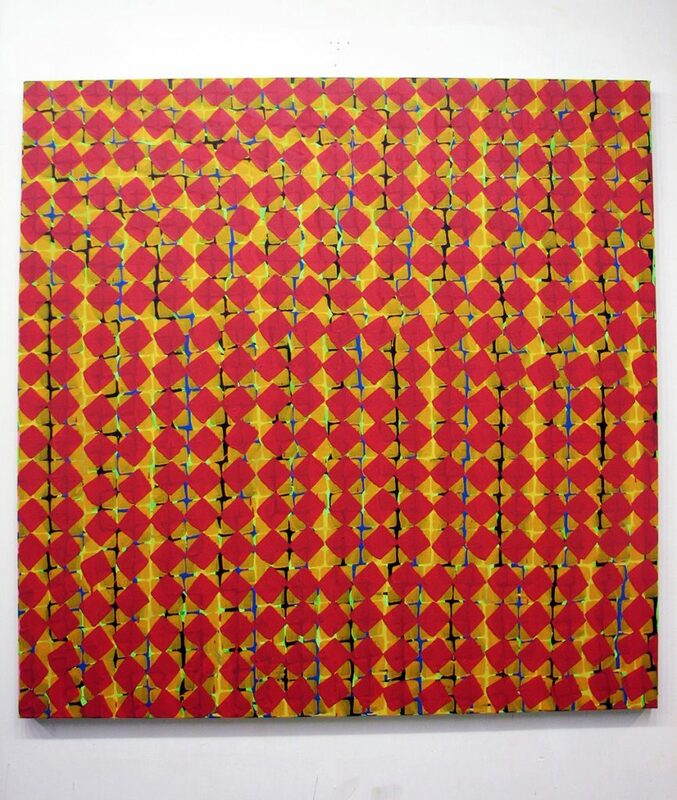 Maija Miettinen’s large scale abstract paintings, composed of repeating bands of brightly colored optical patterns, present a continuous negotiation and investigation between the binaries of subject versus object, open versus closed and nature versus culture. Rejecting illusionistic space, Miettinen’s paintings convey the here and now, infinitely renewing that moment of first encounter. While her pattern making references Finnish cultural paradigms, including folk patterns and craft, Miettinen’s paintings find their humanity in the poetry of her mark making. “Where the configurations start falling apart and the imperfection of the hand become visible, I see vulnerability but also delicate tension and confusion,” said Miettinen. Born and raised in Helsinki, Finland, Miettinen has lived in the United Sates for the past 12 years. Her artwork explores the theories of cultural marginalization, liminality and power in the global world, and examines how her work emerges from her immigrant reality yet is not a direct reflection of her biography per se. Mark Harris, a British artist, writer, and curator, former Coordinator of Critical Studies at the Goldsmith College, London and current professor at the University of Cincinnati wrote about Miettinen’s work for the Ohio State University’s 2015 MFA thesis catalog Phase Shift. 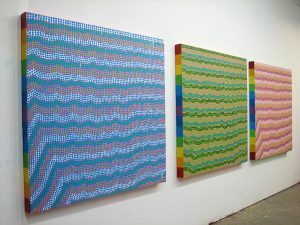 “Miettinen courts the irresistible facticity of textiles, their irrefutable presence, not meaning anything in particular, fabricated, indefinitely replicable, supple, mutable, able to be cut and sewn, worn and washed,” said Harris. Miettinen currently lives and works in Columbus, Ohio where she carries on her studio practice and teaches art at the Department of Art at the Ohio State University. She received her Master of Fine Arts degree, with a graduate minor in Comparative Cultural Studies from the Ohio State University in 2015. “Rhythm of the Whole” will be on display through August 3, 2016. The Finlandia University Gallery is in the Finnish American Heritage Center, 435 Quincy Street, Hancock. Gallery hours are Monday to Friday 8:00 a.m. to 4:30 p.m.
For more information, call 906-487-7500.